If your Grade 10-12 Maths students are not yet taking advantage of this great, free service offered by Microsoft please get them registered as soon as they return to school in the third term. This is a free service that they will benefit from enormously. On 26 November 2014 the Nokia MoMaths name changed to Microsoft Math due to the acquisition of Nokia Devices & Services business by Microsoft. The new name for the service was selected to be Microsoft Math. https://math.microsoft.com. This is a great site for Grade 10-12 Maths students to use after hours either in groups or individually to revise their Maths content and get help with any queries. One of the many advantages of this program is that it is an after school free programme and learners can set up their own study groups with friends and see how they are doing or compete with each other! The program is also accessible from a PC or a tablet. If you are a Maths teacher and you don’t yet know about this service, why not try it our this holiday for yourself by going to https://math.microsoft.com and registering. You’ll be amazed! Claire is an expert on using Alice in the classroom. 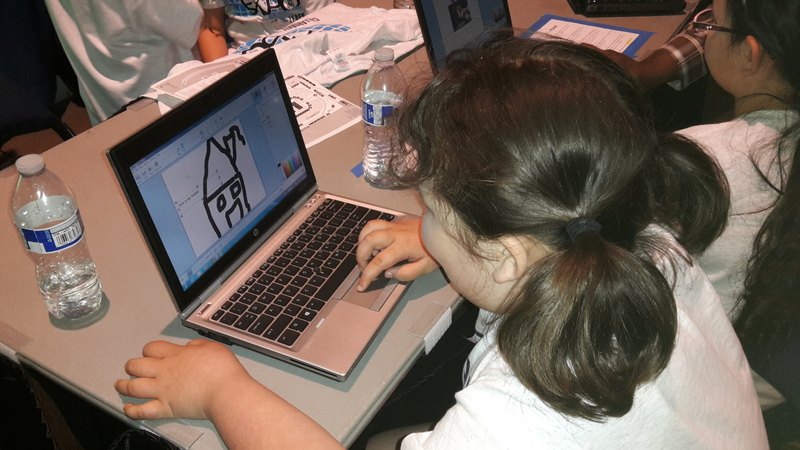 Alice is a free, innovative 3-D interactive animation environment (suitable for learners who are ten years old or older) that makes it easy to create an animation for telling a story, playing an interactive game, or a video to share on the web. Telkom Foundation in 2014, sponsored ICT infrastructure worth over R 200,000 per winner in each of the twelve categories of the National Teaching Awards. As part of Telkom’s ongoing support in education, they have partnered with Rally2 Read in an attempt to improve literacy in Primary schools and in addition are providing ICT infrastructure that includes content, maintenance, support and a professional development pathway for teachers in project schools. SchoolNet South Africa has recently been appointed to conduct professional development workshops required for teachers in the thirty six Telkom Foundation Schools in three provinces viz Eastern Cape, Free State and the Western Cape. All schools are multigrade farm schools and albeit small in size still have a massive need to help learners gain a more global perspective to live and be aware of opportunities that are available to all learners irrespective of their circumstance. SchoolNet trainers are trained to use the cognitive apprenticeship model of training where shaping and fading techniques are used to encourage teachers to develop self-reliance in order to become independent learners. The instructional design of the materials included in this initiative is framed by the context of the teacher and attempts to employ just-in-time learning strategies and not just-in-case. 21st century teaching and learning as well as project-based learning feature prominently in the SchoolNet philosophy. The focus is to monitor teachers’ implementation of what they have learnt during our courses and to understand what more might be needed to help teachers progress beyond attendance of courses to integrate ICTs into teaching and learning activities that engage learning. This project includes two types of interventions: one for Principals and Senior Management Team and the other for teachers on ICT Integration. The Principals/ Senior Management Team will benefit from a seven day Change Leadership course offered to all principals and SMT from each of the project schools over a period of seven months. Each module will be facilitated once a month and this will allow participants time to complete activities at school and achieve badges in between modules. ICT Integration: There will be a range of courses from beginner to advanced and schools will be able to choose (with assistance from SchoolNet facilitators) the courses that best suit their immediate teaching and learning needs. These courses ranges from Intel Teach Getting Started to Project Based elements. All provinces have started training in Change leadership and are beginning to start with basic digital literacy skills. Fifteen teachers are being sponsored their attendance of the ICT in the Classroom conference in KwaZulu Natal. The wealth of skills and knowledge will catapult teachers into the next step of using content to engage teaching and learning. We look forward to seeing and hearing the gains made by our valued teachers. In October 2015 SchoolNet, Parklands College in Cape Town and Selbourne Senior Primary in East London will be hosting two EdTechTeam Google Summits as well as three Pre-Summit workshops (which are outlined below). Please visit http://za.gafesummit.com/ to register. Maths students at High School often need every bit of support that they can get to help them with their Mathematics skills. That is where Microsoft Math comes in. It is a free service originally known as Nokia Maths. All students have to do is register at https://math.microsoft.com and from there on they can use a smartphone, tablet or PC to access the free service and the materials. It is also available as a Windows Phone application, which makes the service content accessible offline allowing students to continue practicing even without internet connection! The curriculum for South African students is based on the CAPS curriculum for Grade 10-12 in South Africa. This service is available in many countries and it adapts to the Maths curriculum for the particular country. For example, it is also available in Tanzania. Watch secondary and high school students and teachers in Dar es Salaam, Tanzania share their experiences with Microsoft Math, and hear from the Director of Teacher Education at the Ministry of Education and Vocational Training in Tanzania about the goals the government has for the service, and what challenges Microsoft Math is helping to overcome. Students can do Maths exercises, read theory, learn from examples, and take tests. Microsoft Math has been designed to make the learning experience personal, engaging and exciting. The great things about Microsoft Math is that students can do all of this 24/7! Microsoft Math also adds a social dimension to education, making it possible for students to collaborate and compete with other students. Teachers can use Microsoft Math to motivate, monitor, and track learning and skill levels, giving more specific and individual feedback to students. It's a great tool for enriching the learning experience, engaging students even after school hours and outside classrooms. How do you transform Mathematics from the most disliked subject in school to every student’s favourite pastime, even beyond school walls? By introducing Microsoft Math! With holidays coming up it is a good idea to encourage your Grade 10-12 Mathematics students to register for this amazing, free service. We are pleased to announce that we will be holding a SchoolNet free webinar on Thursday 25th June at 3:15pm on ‘Alice – how you can use it in the classroom’. Our speaker will be Claire Dean from Stirling Primary School in East London. Claire is an expert on using Alice in the classroom. Alice is a free, innovative 3-D interactive animation environment (suitable for learners who are ten years old or older) that makes it easy to create an animation for telling a story, playing an interactive game, or a video to share on the web. We invite you to join us at the webinar. Summary: Alice 3 is an innovative 3D programming environment that makes it easy to create an animation for telling a story.Alice 3 is a freely available teaching tool designed to be a student's first exposure to object-oriented programming, learning fundamental programming concepts. Alice is suitable for learners who are 10 years old and older. This is another guest post from Linda Foulkes one of South Africa’s Microsoft MiE Experts for 2015. Linda’s blog can be found at: https://folklind.wordpress.com. This year eight teachers from South Africa, who had been selected as Microsoft Innovative Educator Experts for 2015 attended one of the two Global Forums as part of their prize. In the last post we will featured a report back on the Dubai Global Forumby Karen Stadler. Today Karen Linda Foulkes reports back on her visit to Redmond. Ever since I can remember, I have always been drawn to Microsoft Technologies, whilst working in corporate and academic training environments for more than 25 years – it all started at UCT, many moons ago, and two of my biggest dreams were to visit THE Microsoft building, or to work for Microsoft. Thank you, Microsoft, for making one of my dreams come true during 2015! The opportunity to be physically present @ Microsoft Redmond, Building 92, was awesome! The last session I chose was OneNote [of course, I chose that session as I love OneNote :-) – always more to consume]. Joshua Sawyer and Kevin Sait [Head of IT Strategy for Wymondham High Academy Trust in the UK] were absolutely outstanding – learnt so much from their experiences with OneNote and also how Kevin implemented Wymondham High O Team, a group of students who have been instrumental in developing the use of Office 365, OneNote and mobile devices at his school. a great session with an interactive task! These are just a few of my best moments from E2 – the most beneficial for me was the contacts and collaborative opportunities I achieved through being an MIE before, during and after the E2 Global Forum. I encourage every teacher to submit their learning activity for 2016 and that you sign up for the Educator Network on http://www.educatornetwork.com for amazing free tools, learning activities, tutorials, projects and earn badges for free professional development courses. 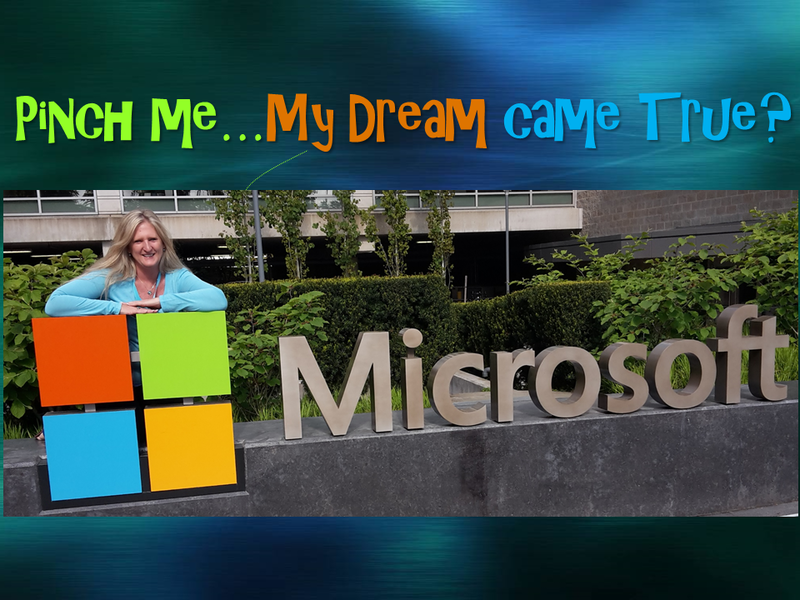 This is a guest post from Karen Stadler one of South Africa’s Microsoft MIEExperts for 2015. Karen teaches at Elkanah House Senior Primary and is well known globally especially for her Travelling Rhino project and her award-winning wiki. This post can also be found on her blog on this link. This year eight teachers from South Africa who had been selected as Microsoft Innovative Educator Experts 2015 attended one of the two Global Forums as part of their prize. In the next two posts we will include a report back on the Dubai Global Forum and the Redmond E2 Global Teacher Exchange. Today Karen Stadler reports back on her visit to the Global Forum in Dubai. 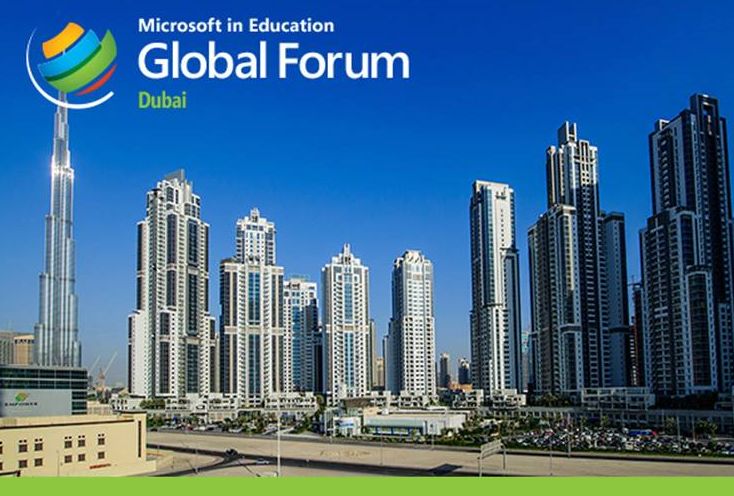 Having been selected as a Microsoft Innovative Educator for 2015 at the end of last year, I was honoured to be one of four South African educators chosen to represent South Africa at the Microsoft in Education Global Forum in Dubai earlier this year. I travelled from Cape Town to Johannesburg with fellow MIE Expert, Kathryn Gomes Riva from Micklefield Junior School, and we met up with the rest of the South African contingency at OR Tambo International, from where we all travelled directly to Dubai. The South African contingency consisted of educators such as Kathryn and I, Lyneth Crighton from Brescia House who travelled with her principal, Benedikta Nott, and Phuti Ragophala, a delightful school principal from Limpopo. There were also a number of delegates from the Department of Education, academics from higher learning institutes, such as the lovely Sarietjie Musgrave from UFS, as well as some of their business partners. All-in-all we made up a large group. 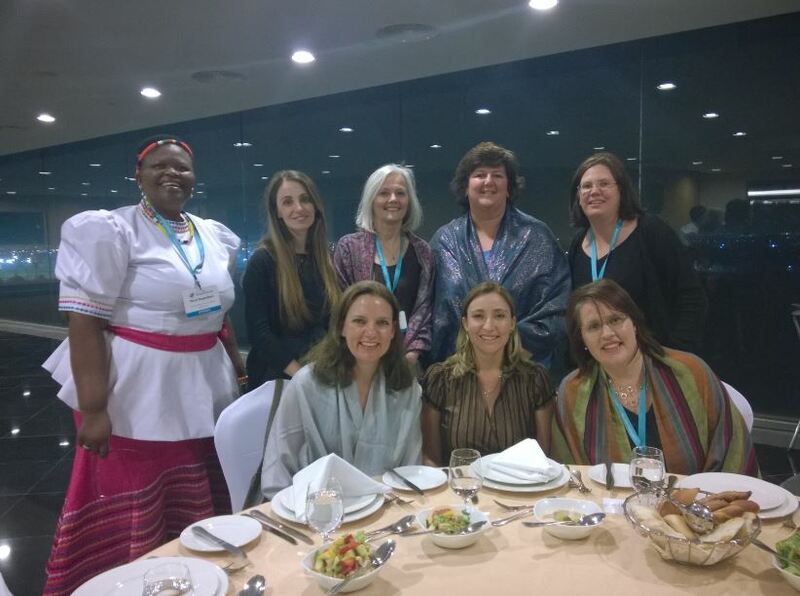 We were wonderfully chaperoned by Angela Schaerer from Microsoft South Africa and Megan Rademeyer from Schoolnet. Upon arrival we were driven to our hotel, the Grand Hyatt Dubai, which was also the venue for the forum. What a hotel! From the opulent foyer, to our stunning en-suite rooms with free wi-fi, to the deliciously decadent breakfasts and beautiful gardens surrounding the hotel, we were treated like royalty! What a treat this was for all of us! Most of us were keen to see as much of Dubai as possible in the short time that was available to us, so we made use of the free time we had for the rest of that day and many of us quickly freshened up and then we hopped into taxis and headed for the Dubai Mall. Oh. My. Word! Who knew you could go to an aquarium while shopping and then quickly stop off for a session of ice- skating too? In a shopping mall? Dubai certainly takes shopping to a new level! After a jaw-dropping walk around the mall and a bite to eat, we returned to our hotel for a little R&R. Not much though, because we returned to the mall again later in the evening for a quick dinner and to see the fountains outside the mall, which put on a display every half hour against a the backdrop of the Burj el Khalifa – the tallest building in the world. And it is tall. Very tall. He said that while a wothwhile goal would be “a device for every teacher and student in my country,” technology should not be the goal, but enabler of better learning so as to build employable skills for youth preparing them for a stronger future and career.“Technology can help drive student excitement and collaboration in the classroom, something that forms the basics of learning,” he said. “Technology is not the plan, technology can help the plan.” So true. Anthony also made some exciting announcements about the free availability of Office 365 and Office 365 ProPlus to students, faculty and staff all across the world – with immediate effect! The Educator track sessions were very interesting, especially the ones on Designing 21st Century Learning Experiences and Concepts and Contexts for Deep Learning, where fellow South Africa, Lyneth Crighton did a sterling job in presenting her project. She certainly gave me food for thought. That evening we were treated to a wonderful dinner at the Regional Dinner which took place at the Meydan Hotel, a short drive from our hotel. Again it was a feast! A lovely evening was had by all. Monday, 23 February was the second and final day of the forum. Once again the Educator’s Track I was privileged to have been asked to participate in a panel discussion called Connecting Educators, Students, Classrooms with educators Sahar Chaer from Lebanon and Manu Mital from India and this was certainly a highlight for me. 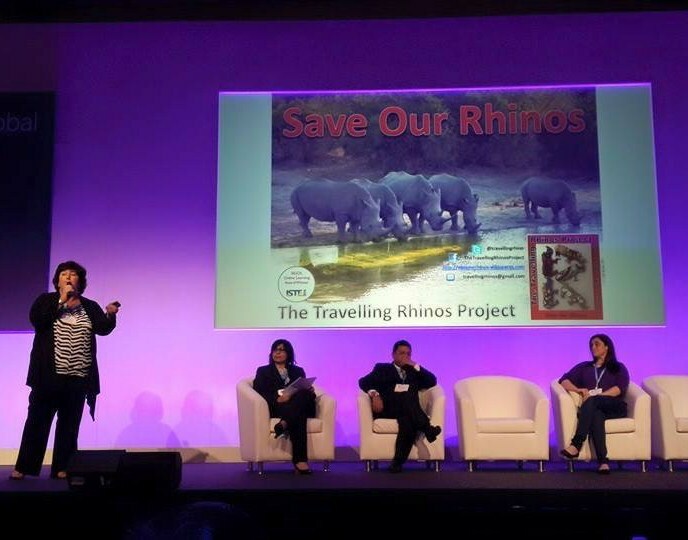 I was afforded the opportunity to present my Travelling Rhinos Project to the audience, as an example of how such a project can connected classrooms around the world in a meaningful way. What an honour, what an experience! What did I learn from the Forum? That passion is the key to great teaching – passion for the students, passion for the content and the delivery of content and a passion for education as a whole. Teachers around the world face many of the same challenges, we are united by our profession and dedicated to changing lives. We may speak different languages, but we speak one common educational language. I am fortunate to work for a privileged school where we have and use different forms of technology in our classrooms, and we do our best to stay abreast of current trends in education, but South Africa as a whole, is way behind on the technology playing field. As a country we have a long way to go. Collaboration across borders, oceans and continents is important in order to foster understanding and tolerance for the many different peoples and cultures of our world. If our children learnt this from a young age, our world could be such a different place! That the countries in the world whose education systems are working and are producing top results, treat their teachers with the respect they deserve. However, the selection process to become a teacher is much more stringent, and so it should be. In these countries education is continuously discussed at the highest levels, strategies are developed and plans put in place to educate their children so that they can be the best that they can be, not merely to finish school. Cloud technology is the way if the future if it isn’t already. This does, however, exclude a large portion of the world’s children in countries where internet connectivity is poor and bandwidth costs are exorbitant. Our own internet in South Africa is of the slowest and more expensive in the world, and children in rural areas are, in the main, excluded from tapping into this resource that most of us living in a first world situation cannot do without. I would have loved to have seen more teacher projects and work on display. I love to learn from other educators who share their ideas and expertise. Microsoft has really upped its game and its new offerings are exciting and really innovative. OneNote (on steroids), Office Mix, Sway, the new Surface Pro 3 tablet and Windows 10 are all worth a good look and deeper investigation. Exciting times for educators! At the closing of the Dubai Forum, the 2015 MIEExperts and Showcase schools were honoured for their achievements. We were called up country by country, and handed a certificate acknowledging the innovation in teaching and learning of these educators. It was a very Proudly South African moment indeed! On the Monday evening we were treated to an evening dhow cruise and dinner. What an excellent evening of good food, lovely people and great entertainment! On the day of our departure, 24 February, we had a whole day to explore Dubai, as our plane was only leaving at 11:30pm. Kathryn Riva and I jumped at the chance and we spent the day touring the whole city, hopping on and off one of the Red Bus tours. It was wonderful and gave us an excellent overview of an amazing city – one I would like to visit again in the future. I am very grateful to Microsoft South Africa and SchoolNet for this wonderful opportunity of a lifetime. It was an incredible experience and we were treated like royalty. Thank you to everyone concerned. SchoolNet says: Thanks for this post, Karen. Exciting opportunities await those who enter this competition. The competition opens again in August and we encourage any readers of this post to consider entering. On Thursday afternoon 11th June we held a webinar entitled, ‘Microsoft Sway – what it is, how to use it in the classroom, and how to create one’. Sway is a new, free presentation web app - part of the Microsoft Office family of products. It creates lovely eye-catching, attractive, online presentations. It is also available as a iOS app. All you have to do to get started is go to this URL https://sway.com/ and join up by creating a Microsoft ID. Then just explore! Sway allows one to combine text and media to create an online presentation with a difference! You can pull content locally from your device, or from Internet sources such as Bing, OneDrive, YouTube, Facebook etc. One can add videos, text, images, sound…you name it. Before you know it you have a stunning presentation! This week the African Storybook Project sent out a newsflash showing their most recent story updates. We have displayed them below with links to their spot on the website. Have you visited http://www.africanstorybook.org/, the home of the African Storybook Project (ASP)? It is a truly amazing, local website. The stories, which are all for the younger grades, can be read on site or downloaded to print and use. Their current collection of Featured Stories on the website home page is a great reflection of the ASP's growth and diversity after just one year in existence. The aim of the African Storybook Project is to provide Creative Commons-licensed stories for the children of Africa in all the local African languages as well as the languages of wider communication used on our continent. A Grade 9 learner from the Free State surprised the Applications Olympiad organisers by making it to the Finals with 13 matriculants. Albert Dreyer cannot yet take IT or CAT at school, but he is involved in an enrichment project at the University of the Free State. The project entered him in the Applications Olympiad. The Applications Olympiad challenges learners to use a Word Processor, Spreadsheet, Database or Presentation tool to solve problems. Participants are mostly learners taking CAT at school or learners who have otherwise learned to use Computer Application tools using programmes such as the International Computer Driving Licence or IC3. Roche Visser and Robert Wood have made the Finals for a second time. Robert won a bronze medal last year when he was in Grade 11. On Thursday afternoon 4th June (today) we had planned to hold a webinar entitled, “‘How to use Microsoft Sway to teach, share and archive learning activities’ by Phuti Ragophala from Pula Madibogo Primary”. Unfortunately we had to cancel the webinar because Phuti’s school experienced severe connection problems that day and we couldn’t connect Phuti to the webinar. However we do have the webinar presentation uploaded to Slideshare for you to look at. In this presentation Phuti shows how to use Sway.com to teach, share and to archive learning activities. She says, "Sway is one of the recent apps by Microsoft which is very much user friendly. I use it to text messages, to upload videos, to paste images and paste recorded YouTube and Skype videos and for learners to upload their projects with images and animations".She shows examples of her learners' work." We hope to be able to hold the webinar at a later date. Have you tried Microsoft Sway? There’s so much you can do with it! I am writing about a new Microsoft product called Microsoft Sway that I have been using with Grades 6,7 and 8 at my school. Sway is a free presentation web app - part of the Microsoft Office family of products. It is also available as a iOS app. All you have to do to get started is go to thisURL https://sway.com/ and join up by creating a Microsoft ID. Then just explore! What I love about Sway is that it allows one to combine text and media to create an online presentation with a difference! You can pull content locally from your device, or from Internet sources such as Bing, OneDrive, YouTube, Facebook etc. One can add videos, text, images, sound…you name it. Before you know it you have a lovely presentation! I set the Grade 7s and 8s an assignment on social networking using Microsoft Sway. The aim was two- fold – for them to experience using Microsoft Sway, and for them to investigate the dangers and advantages of social networking. I presented them with the assignment using a Sway as a demonstration so that they could see it in action. With the Grade 6s we've started to collect the poetry we've written this year and display it in Sway as a portfolio of our poetry. This short Microsoft video tutorial is presented by Koen Timmers. This application, Sway, is fun for students! They latch on to how to use it very quickly. The possibilities are endless… Why not try it? We will be holding a short, free SchoolNet webinar on Thursday 4th June at 3:15 . Our speaker will be Phuti Ragophala from Pula Madibogo Primary in Limpopo.who will share on using Microsoft Sway to teach,share and to archive learning activities. We invite you join us at the webinar. Summary: In this webinar Phuti shows how to use Sway.com to teach, share and to archive learning activities. She says, "Sway is one of the recent apps by Microsoft which is very much user friendly. I use it to text messages, to upload videos, to paste images and paste recorded YouTube and Skype videos and for learners to upload their projects with images and animations".She shows examples of her learners' work." How are teachers using Microsoft products in the South African classroom? Mabore Lekalakala says: Office Mix makes work easier for me as the teacher, learning fun for my learners and saves both of us time. Do something a little different and create a PowerPoint using the new free add-on Office Mix Here is a short video that I created on how to use it http://bit.ly/1FYbMTl. It makes teaching and learning Interactive and FUN!! Easy to use and the students love it!! This is great for for a blended classroom! One of the great things about Skype is that you can bring other countries into your classroom real-time. A group of 5 educators from South Africa, Canada, Singapore, China and Croatia have been working on a project about fear. As a class we discussed what fear meant to each of us. We realized that fear and overcoming our fears was unique to each individual. We created a shared Microsoft OneNote file that the students were then able to share their own fears. We used a guest login so that the students could type in their own personal feelings allowing them to keep their own anonymity. Click below to view the OneNote shared file http://1drv.ms/1IXtHdo. Today we conducted our first Skype session with these countries. Each of the different classes from around the world had turns in discussing their fears and how they could overcome them. It was really an awesome session! One of the students commented: “It’s comforting to know everyone around the world has fear, and our fears is like different shades of the same color.” The WOW factor is amazing! Bringing different countries into your class and let children share their experience.